Showcase those special birthday memories in a photo album! How many pictures did you take of that last birthday party? If you have a digital camera - probably hundreds. 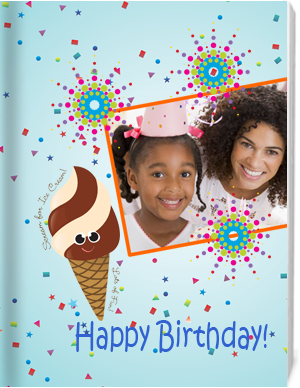 Why not build a custom photo album to display the fun activities during the party. It's free and easy to do online with the Photogalley software. Be sure to share your creation with the families who attended, so they can see all the fun activities that took place at the party. Children really enjoy seeing their pictures in a real book they can touch so don't forget to order that hardcopy. Designing your album is as easy as 1-2-3 when using Photogalley by uploading photos choosing a template and auto-flowing the template. Choose from many attractive layout templates to go along with your birthday theme, new templates are being designed every week by our staff of designers. If you are the creative type you can create your own theme from scratch the choice is yours. With all the photo book printing options Photogalley has available it's easy to create that special book. And don't forget our other photo printing options like calendars, posters, cards and more all of which are a great way to showcase those special birthday pictures. Celebrate birthday with a beautiful photo book!